To celebrate his 25th anniversary of work, Super7 will be welcoming the legendary Pushead for a special '125 Minutes of Pus' event on Thursday, July 20th starting at about 4:30 PM at their SDCC booth. Super7 will have several special items that will be available only for sale during the event, never to bee seen again. At the top of the list is the a special edition Came from the Sea Skullpirate figure produced by Secret Base, the first Skullpirate to be released outside of Japan. This one is limited to 125 pieces and comes with a signed tag and Skullpirate bandanna for $75. There's also a Jar of Pus circus punk limited to 25 pieces for $100 each. 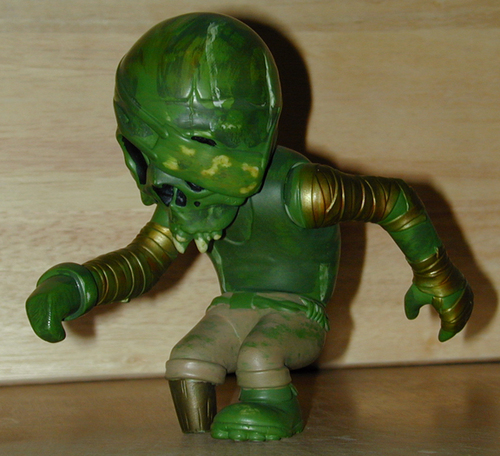 Plus, several one-of-a-kind vinyl figures hand-painted by Pushead will be available during the event. Pushead will make a personal appearance at the event and may sign items for fans. This is also your chance to meet Hiddy from Secret Base. Definitely not to be missed. Props to Isaac of Super7 for the info + pic. i have to say that thats really cute!! especially his li'l stumpy pegleg!!!! It's great! But for $100 I'll pass.